Feeding frenzy: Julio Resto, lead caretaker on Cayo Santiago, dumps a bag of monkey chow. The storm leveled feeding corrals on the island. 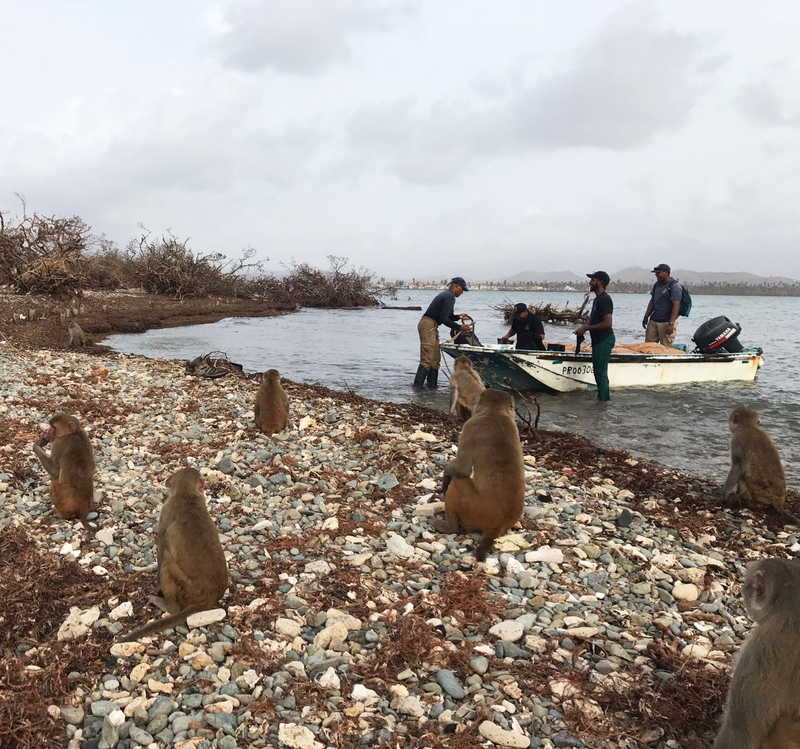 Many of the monkeys living on Cayo Santiago, an island off Puerto Rico, are likely to have survived Hurricane Maria, which pummeled the island on 20 September. 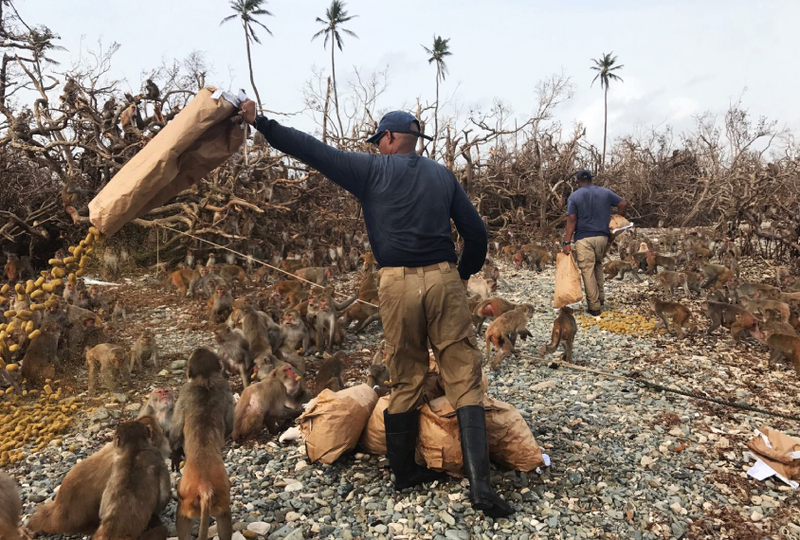 But the storm’s aftermath has left the island’s more than 1,500 rhesus macaques — including some used for autism research — in jeopardy. Maria’s 155-mile-per-hour winds leveled a field station, stripped trees of their leaves and destroyed feeding corrals and rainwater collection systems. Without a working water system and the shade provided by trees, the animals could perish in the hot sun. Researchers have launched a fundraising campaign to rebuild the water system and deliver critical supplies to the island, which sits half a mile off the coast of Punta Santiago, a town on Puerto Rico’s eastern shore. There is still no power, and field station employees need everything from solar panels to infant formula for their babies. Checking in: Employees of the Cayo Santiago Field Station arrive on the island by boat on 27 September, one week after Hurricane Maria. Known as ‘Monkey Island,’ Cayo Santiago is considered a research treasure. Since the 1950s, scientists have monitored every monkey on the island, recording observations on the animals’ parenting skills, cognition and social-emotional reactions, including response to death. The field station hosts researchers and students working on 10 research projects, including ones focused on autism. Staff and researchers have reported that there are at least 500 surviving monkeys, a number that includes some from each of the six social groups that the monkeys maintain on the island. They say they have not seen dead monkeys, which would indicate mass casualties. “Somehow, monkeys are good at surviving a calamitous event,” says Michael Platt, professor of psychology at the University of Pennsylvania. Platt has been doing research on the island since 2007. He is investigating how naturally occurring genetic variants in the monkeys affect social behavior. About one in eight monkeys on the island has a naturally occurring variant in SHANK3, a gene mutated in roughly 1 percent of people with autism. Platt and his team have identified monkeys with eight other genetic variants associated with autism. A complete census of the monkeys post-hurricane is underway. Platt says he was heartened to see the distinctive face of 42L, a large female who is one of the least social monkeys. He hasn’t sequenced her genome yet, so he can’t say what genes underlie her aberrant social behavior. A shipment of monkey chow, some of it slated for the monkeys on Cayo Santiago, was stuck on a boat in San Juan for several days after the storm. It couldn’t be unloaded because of damage to roads and vehicles and a shortage of fuel. It was finally delivered to the University of Puerto Rico’s other primate center, the Sabana Seca Field Station, located outside of San Juan, on 2 October. The food for the Cayo Santiago monkeys has to yet to make it to the island, but the monkeys still have some food from an earlier shipment. The researchers have launched GoFundMe campaigns to support field station staff, at least one of whom lost his home, and to help the monkeys; they have so far raised $55,000. “I am waiting to hear what else I can do,” says Katalin Gothard, a neurophysiologist at the University of Arizona in Tucson, who does not work on the island but donated to the campaign because of her interest in monkey models for autism. The Cayo Santiago colony is “an absolutely critical resource for autism research,” she says. Platt plans to travel to Puerto Rico within the next month, when he feels he will be more of an asset than a liability. He also plans to rework a grant application to the National Institutes of Health to examine how Hurricane Maria affects mental health among female monkeys and their children.